The downloadable Paragon Hard Disk Manager 15 Premium is a Windows software program that backs up the contents on your drives to protect them in the event of drive failure or a virus. It supports physical and virtual Windows environments—even if it is encrypted with BitLocker. You can also schedule differential and incremental backups to maximize disk space. New in this version are file-level backup for virtual containers, agent-less protection of Hyper-V guest machines, AES support, and more. Paragon Recovery Media Builder 3.0 is now embedded into this version so you can create WinPE-based bootable media and inject required drivers during setup. 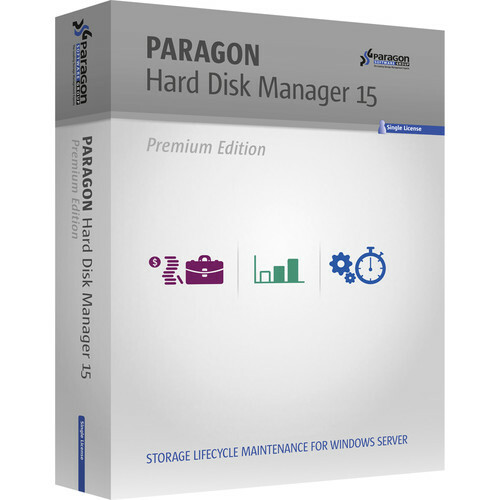 Hard Disk Manager 15 Premium enables you to resize, create, format, or read HFS+ volumes. You can also swap file systems to another type such as HFS to NTFS or FAT to NTFS. To save critical data during a system reformat, it creates a partition for just your data so you can just reinstall the operating system. Migrating your backup onto another computer, Paragon's imaging technology enables you to create a VD container that you can burn to a removable media. In addition, Hard Disk Manager 15 Premium lets you erase data securely with 10 wiping methods. Change the cluster size value to effectively control performance of your system and the so called "waste space factor"